As social media sites go, I have to say, like most women on the internet today, Pinterest rocks! My favorite things to look at are funny cartoons or infographics, humorous images, and gag gift ideas—these pictures speak to me. I have always been a visual person and now with a glance at a page, aha! There “it” is. Just what I was looking for! With all the attention being paid to this social media superstar, it’s easy to become desensitized to the available and all-powerful Pinterest marketing opportunities. As a matter of fact, there are so many useful Pinterest tools available; it is almost impossible to keep track of them all. So for all you Pinterest fans using the social media site for your own pinning or for social engagement/signals for your business, I have compiled a mega list of Pinterest tools that you should check out. Wishpond – Wishpond.com offers social marketing apps including tools to create Pinterest contests. Cyfe – Cyfe.com offers a Pinterest analytics dashboard that allows users to monitor everything from their follower activity to their pin activity. PinTrack – Available via ZDNet.com, PinTrack is a Pinterest follower tracker. Users can instantly see who has followed them, un-followed them, and even see who is not following them in reciprocity for a Pinterest follow. Top Pinterest Users – TopPinterestUsers.com’s name is self-explanatory. This site offers the top Pinterest users across multiple categories. Based upon the number of followers, brands can easily identify the top influencers within their niche. From fashion and weddings to tattoos and technology, this Pinterest resource has every niche covered. Pin My Info – PinMyInfo.com allows users to connect with their Pinterest followers across multiple social networks. Users simply create a Pinterest board to house all of their social media profile links on one central pin board and then pin social media network icons via PinMyInfo.com. From Instagram to LinkedIn to Quora, Pin My Info offers them all. Percolate – Percolate.com offers businesses content relevant to their niche for sharing on Pinterest as well as other social media networks. The Percolate algorithm learns which types of content a business usually shares and then offers more of that type of content. For businesses focusing on content marketing as part of their social media strategy, Percolate is well worth a look. HelloInsights – HelloInsights.com offers Klout style Pinterest analytics. Users are offered analytics relevant to Pinterest influence, trending pins, and even Pinterest growth. ShopInterest – ShopInterest.co is an e-commerce tool that allows Pinterest users to create their own online store from their Pinterest pins. Be careful; this one is highly addictive. Pinterest Perks – Based out of Santa Monica, CA, PinterestPerks.com is still in the sign up phase. Once launched, Pinterest Perks will enable users to earn rewards from brands for pinning products to Pinterest. Pickie – This New York City based startup creates a personalized iPad magazine out of Pinterest pins. Available via the iTunes store, Pickie.com curates popular pins based upon a user’s individual network. Aggregating pins from a user’s likes as well as those of their social network connections creates a result that is visually dramatic and highly engaging. inSparq – Also based out of New York City, InSparq.com offers retailers a live embeddable pin board for their websites. With inSparq’s analytics and data feed, a retailer’s pin board is automatically updated in real time with trending items from the retailer’s social analytics. Sharing products on social media sites earns incentives for end users. This sharing not only benefits the end user doing the sharing but the brand receiving the additional social media attention. HootSuite – HootSuite.com now offers Pinterest analytics in addition to their already impressive list of social media tools. gazeMetrix – This 500 Startups incubated launch allows brands to monitor the pinning of their images onto Pinterest in real time. Rather than scanning through Pinterest searching for their own images, a brand receives notifications via gazeMetrix.com each time one of their products is mentioned on social media. Piqora – Based out of San Mateo, CA, Piqora.com offers a full range of Pinterest analytics and marketing tools. Users can schedule pins, run Pinterest contests, and even obtain metrics as to viral pins and brand advocate engagement. Alertpedia – Alertpedia.com notifies users whenever a Pinterest user they are following adds content to their Pinterest pin boards. For brands monitoring influential users on Pinterest, spotting trends via Alertpedia can be highly useful. SnapITo – SnapITo.com allows users to pin screen grabs onto Pinterest. Rather than pinning a single image, users can utilize the SnapITo screen grab bookmark to snap an image of an entire website. This tool could be highly useful to those monitoring websites with rapidly changing front pages like news sites or technology blogs. Woobox – Woobox.com makes it easy for brands to add a Pinterest page to their business’ Facebook account. Facebook followers can see at a glance the types of content a business is adding to Pinterest without ever leaving Facebook. For brands engaging with their audiences across multiple social media platforms, adding Woobox to Facebook is a no-brainer. 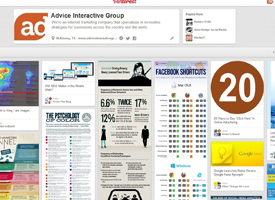 What Helpful Tools Do You Use for Pinterest? This mega list of useful Pinterest tools are some of my favorites in terms of available marketing aides for businesses doing social. I’ve shown you, now you show me! Which Pinterest tools have you found to be the most valuable in your brand building efforts?